World of Warcraft | Tank That! As you can find from Wowhead’s new guide to the 2011 Feast of the Winter Veil, a few things have changed in our beloved Christmas holiday Warcraft event. The biggest change is to the former Abominable and beloved Metzen the Reindeer quests. Where in years past you had to fight like a dog to just get the claim on the Greench to get your Snowman suit, that is no longer the case. The once one time quest is now a daily quest and combined with the saving of Metzen. So head on out to Alterac Valley, but make sure you bring your friends. The changes to the Greench have made him much meaner. He is now a level 85 elite with that hits fairly decently on a Protection Paladin. While soloable by a tank correctly using personal cooldowns, he is definitely no longer a pushover. Thankfully you do not actually have to be grouped up to kill him. Learning from early mistakes, Blizzard has seen fit to “drop” the item required to complete the daily quest on the ground near the “Christmas Cave” after he is dispatched. You may be saying to yourself, why do the daily at all? In the past the quest was only there as a way to get the Snowman Kit in order to complete the Winter Veil meta-achievement. It still does that, but the quest actually rewards you with a Stolen Present for you to keep as well. The present can contain the new Lumpy (of coal) pet, anything sold in the Dalaran Toy Shop as well as any of the old yearly exclusive gifts. That’s right, if you do not have a BB gun, or a Clockwork Rocket Bot, or a Mini Zep Controller you can get them from the bag. The Clockwork Rocket Bot gives you the Feat of Strength for the 2007 pet, but the other exclusive gifts do not. Good luck and go grab those achievements and that one Feat of Strength if you were like me and didn’t have it. I honestly do not have any real opinion on the subject. The video itself seemed extremely shady on both sides. Mostly because it did not actually allow for us to see a timeline of events, nor did it show the actual server going down. Just him saying the words “guys we dont want to crash the server” (or something to that effect) and him in game getting notice that he was banned. We, the people who are commenting here, have no idea what Blizzard’s investigation shows. I for one can say, that if Bashiok is to be held to his word (which I am less and less inclined to do but am willing to give him the benefit of the doubt), the GM that actually used the banhammer in game did so without following the correct protocol. Watching the video at least, we are lead to believe that there was some sort of streamed live event, the servers went down, he logged back in and was banned on the spot. We as outside observers do not know if this is the case. We are not even privy to the exact thing he was original banned for. We do NOT have all the information. Unfortunately, Blizzard and Bashiok specifically have lost their ability to manage their own community. They have lost their touch and have lost their ability to do any good P.R. spinwork. They realized too late that this player that their GM team had banned was an “internet celebrity” and Player sponsored by one of their key merchandising partners. This is the most unfortunate thing. Whether or not the ban of Swifty (and friends) was appropriate or not, we are left with very clear idea that Blizzard fucked up and did so multiple times during this fiasco. We now have the distinct feeling that 1) they may have not followed their own internal protocols on how to handle player bans/investigations 2) that they can and will be swayed by a large amount of forum outpouring and Youtube hype and 3) that they will bend over backward for their Sponsor/Partners. While 0-3 of these things may actually be true, we are left with the feeling that they all are. The saddest fact that has come out of this mess is that we are left now with Bashiok and when you add all of this to all of the rest of the recent messes, we are left with a community that has very little respect for him. He has gone from a community manager who people listened to and grudgingly respected to someone who just seems like a little informed brat. The forums lately have become a festival of gripes over this or over that. This is not the first time this has happened, it is just the first time that the CMs seem to be doing nothing but fueling the fire. In my opinion, Bashiok should take a much needed break away from the forums and let someone else take over his role for a while. We could use some new blood feeding us the WoW news everyday. Both the good and the bad are there to be had everyday, but we could all stand to lose a lot of the thread deletions, this thread already exists, and other random junk that is fast making the CMs sound and feel like just a bunch of bullies and the userbase feel less and less heard. 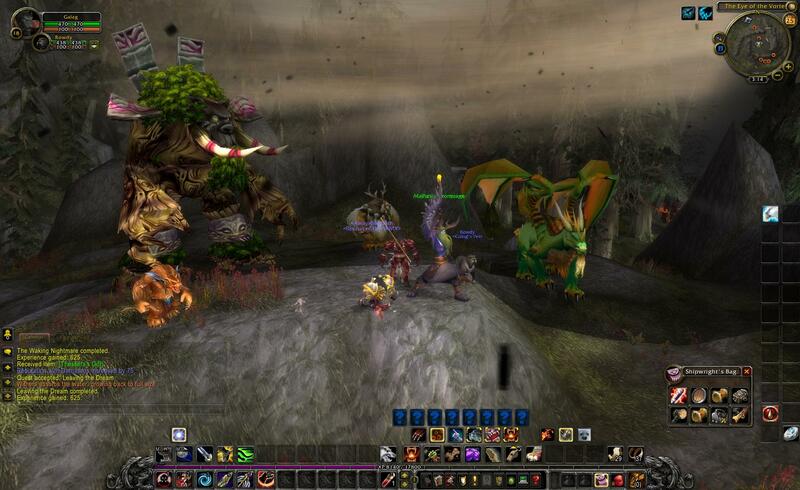 Yesterday was the beginning of the 2010 edition of Brewfest. World of Warcraft’s little ode to the dwarf and their penchance for the over consumption of alcohol. Now I could get all high and mighty and discuss the implications of aggrandizing drunkeness, but I won’t. I will however point out Blizzard’s seeming ineptitude when it comes to this particular event. Now, this is one event that was tidied up last year. It was given a minor overhaul. They took away some minigames and added a few new ones. They managed to up the level of difficulty of the boss, Coren Direbrew to make him not a joke to those players who decided to partake in the farm-fest that was trying to obtain one of the rare event only drops. The two mounts being the biggest rarities. The managed to fix this part of the event as well. With the addition of the Dungeon Group Finder, we are now only subject to fighting Coren once a day per character to try to obtain these rarities. I’m sorry to say that, at present, there is no new Brewfest Stein for this year, nor is there planned to be. Sincere apologies for any annoyance this may cause you, but hopefully some will be pleased by the ability to catch up on something missed out year. This is the problem. Many people want their “souvenir” or their Feat of Strength for obtaining the things that can not be obtained ever again. I have a friend that is still pissed off at himself that he missed obtaining the 2007 Brewfest Stein. Now to slap him and others like him in the face, you can obtain the 2009 stein in 2010? What is Blizzard thinking? Seriously, this is beyond lazy. If you do not want to add anything to the event that’s fine. If you do not want to take the time to recolor an existing piece of artwork and work it into the event as the 2010 Stein, that’s fine. At least take the previous year’s stein out of the game all together. This to me is a sign that Brewfest will not be around in its current form in Cataclysm. Which is not something that couldn’t be foreseen. The world is different come the escape of Deathwing. The events we have seen for the past several years could be changing drastically with them as well. You would think that Brewfest itself is a generally innocuous event that is held in an area that isn’t seeing much change. Yet others will definitely be effected. With Alterac and Tanaris being greatly changed could Metzen be getting a new “home” away from home as well come Christmas? At least I got a Kodo on my warrior. Five more days of trying on the others. 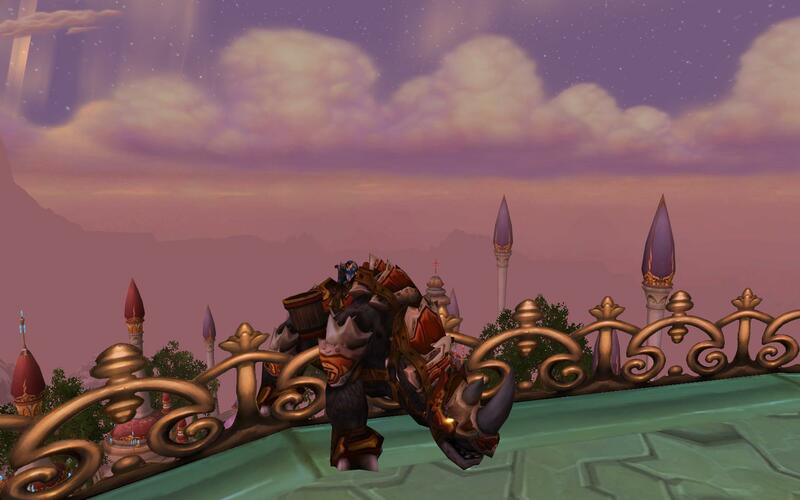 With this the warrior has all 3 Brewfest mounts. Like most zones in Cataclysm, Darkshore has gone through a major redesign. While most other areas in the game have changed dramatically, there are some areas where old quest lines remain. These areas have one thing in common, most of them have felt the Cataclysm and its aftermath. The war that followed has changed many other zones. People have died in other places, but no other zone has seen such devastation to its former quest giving NPC inhabitants. In part because of this, there is not a single quest left from before the world was rocked and town of Auberdine so completely devastated. Your experience in the new Darkshore begins in Lor’danel, the new Night Elven homebase in the zone. This is not much of a town in comparison to what Auberdine was. There is only an inn, a few tents and a conspicuously empty Night Elven guard tower. There is no dock to be found in all of Darkshore now. If you want to go to Darnassus or Exodar, all you have to do is jump on a flight path. (Yes, I said that correctly. Exodar is now accessible via flight paths from anywhere in Kalimdor.) If Stormwind is you desired destination, then its a short hop to the remains of Ru’theran Village and hop on the old boat that now docks there. Lor’danel is a much more lush and green “town” than its predecessor, but I would hardly call it a town. It is more akin to a forward base. It has a great deal of amenities, but lacks at least one major one… A meat vendor. Questing through this area as a Worgen Hunter with my default Dog pet was tedious to say the least. Finding meat for him to eat (and he only eats meat) was impossible without going to Darnassus. Even the fauna that has survived the Cataclysm does not seem to drop raw meat nearly as commonly as they did before the changes. It was only because I had kept a good deal of spider bits from the Gilneas experience. The biggest complaint about the original Darkshore was the sheer area of the zone. Questers had to traverse the length of the zone many many times during their 8-10 levels they spent there. The long narrow zone forced players to run North and then back to Auberine, then farther North and then back to town. After that, they had to run south and back, farther south and back. 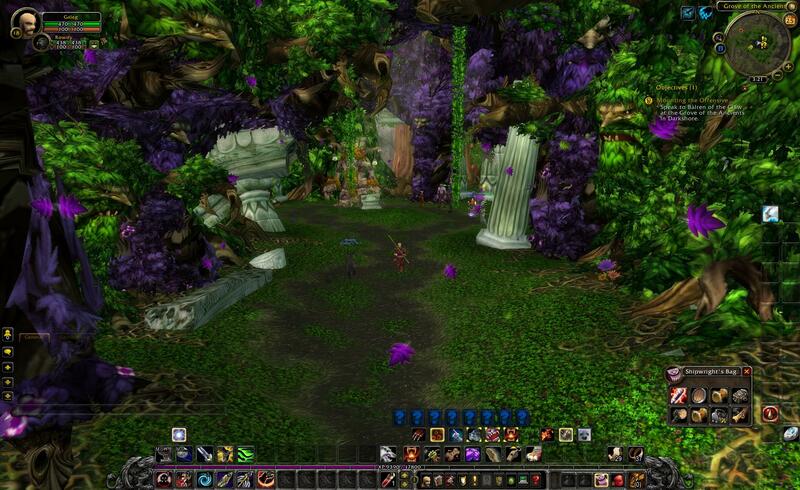 The tedium of this fact made many players turn to Bloodmyst as the main questing area after it was released in TBC. Bloodmyst was a well designed, far more compact zone that had far better quest rewards, storylines and a much more diverse set of enemies. Unfortunately, the developers thought it was better to mimic the design concepts that worked so well in the Death Knight starting experience. This means heavy usage of the big staples that became used and overused in Wrath of the Lich King. The zone is designed for players too low to have access to mounts. Instead of just giving mounts to players at level 10, they have given both of the overly large 10-20 zones their own system of “easy” travel. Thusly, like Azshara and its Goblin Rocketway, Darkshore also was given a system of “catpaths”. Situated at several key points in the Northern Darkshore there are cat calvary guards that allow you to access these “catpaths” to most of the miniquest hubs that you are directed to. This system solves one of the two major issues with the old zone. The changes to the flow of the zone itself solve the other issues. The zone has many “phasing” aspects starting with the major ones in and around Lor’denal itself. Most of the phasing has to do with rescuing and not rescuing the survivors of Auberdine. It is completely unclear how much time has passed since the destruction. Long enough for other areas of the world to have been wrought with war and for Auberdine to have been overtaken by Twilight Cultists and Air Elementals. Yet, you are still asked to rescue former questgivers, flightmasters, innkeepers, etc from the aftermath. As you rescue these npc’s you are continually phased and receive follow-up quests. This is nothing new. We have seen similar questing systems throughout Northrend. To put it simply, the system is not as large as anything in Ice Crown or the Death Knight experience. The phasing, with one large exception, is very subtle. Mostly we will see the results of your efforts being visible in the world. 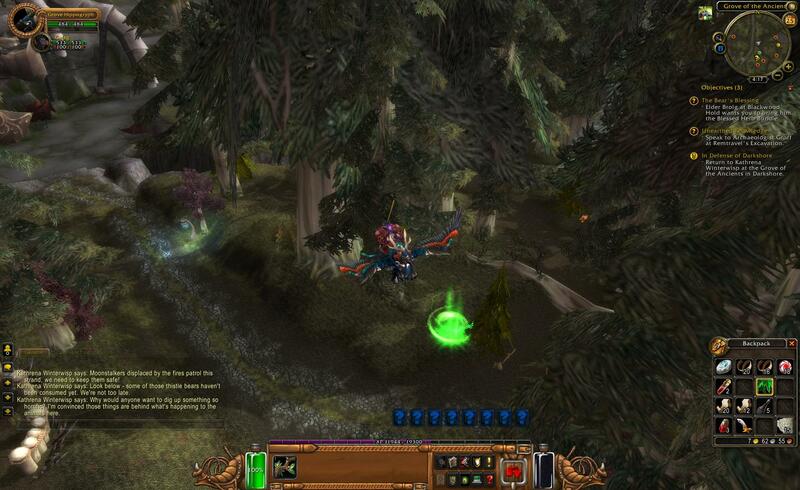 Quest givers and NPCs will appear, disappear and move as you progress through the zone. This fact makes the zone incredibly linear. Which in my opinion is an incredibly bad thing. Don’t get me wrong, the zone is wonderful and fun, but there is very little choice in how you progress. This is a predominant theme so far in my explorations of Cataclysm in its entirety. What was so wonderful about the game thus far has been stripped away by phasing and its resulting prerequisites. Cool quests are fun no matter how you have to come upon them. Yet there is something to be said about being able to choose to do 1 quest and not another. To choose to go “here” before you go “there”. There is basically one non linear quest hub in the area, but even it has a breadcrumb that only appears after you have completed several other tasks. You can complete the hub without ever receiving the breadcrumb, but it’s obviously designed that you do it in an extremely linear manner. Whats so wrong with getting our hands held through to level 20? Well nothing really. Yet it does get extremely old after a while. 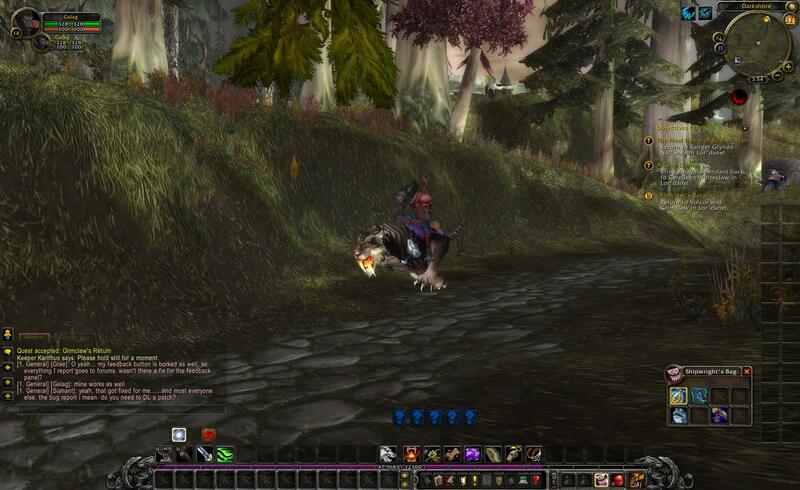 The Worgen starting experience has improved leaps and bounds since I first played in months ago. This time through it was much more informative and interesting from a story point of view, but I had my hand held by some unseen Blizzard developer the entire time. This feeling continues on until you finish the zone completely. The new Darkshore is fun. Well, fun may not be the exact word for it, but it works for this discussion. The zone is interestingly redesigned, we get to see the little story points of the old zone leak in here and there. The often difficult to get to Troll Village is now dance free and trying to expand into the Northern zone with the help of the Horde. The Master’s Glaive is being excavated, and somehow the dwarf archeologist that stands 10 feet away from the Twilight’s Hammer is left untouched? Some things just don’t make a lick of sense. Which is what really hurts the zone. It’s an obvious fact that Blizzard’s “timeline” for the game is completely screwed up. 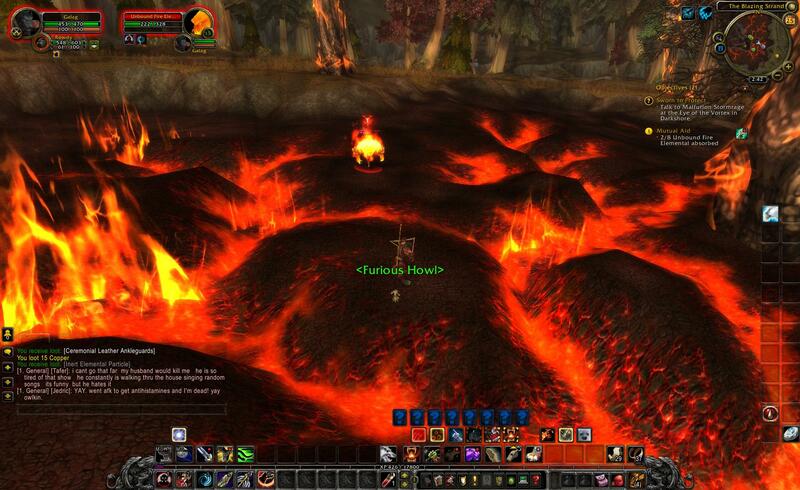 Zones farther into your leveling experience in Azeroth take on a somewhat interesting view on time. Originally it was seen as “time goes by as you level up and get ‘older'”. With Cataclysm this is evident, as your experiences with Malfurion in Darkshore and then in Hyjal would attest to. Time is relative as you traverse the world my friends, be wary to not get too entrenched at what came first or things will begin to unravel more than “How is the Lich King still alive when he’s dead?” quandary that most people are still harping on. In the end, the zone was a let down. The zone ran the gambit of quests from the “go kill 10 Twilight Cultists” to the “go fetch 10 pieces of crab meat”. But these were fewer and farther between. Instead we got loads and loads of gimmicks. There are multiple vehicle related quests. In fact off the top of my head I counted 3 and a few other vehicle related gimmicks tacked on. These include multiple Sunwell style “on rails” bombing runs that have been so completely over-utilized that Blizzard really needs to take a huge step back and say STOP! The zone had its high points and low points. In the end, what could have been an awesome ending with a good reward both in a piece of equipment and plotline payoff falls flat mostly because there is never any real danger. Being lead around by a leash through 95% of the zone and distracted by gimmick quests and famous npcs does not make the zone anymore fun than it was. Sure it is much improved. Some of the gimmick questlines are quite interesting, but in the end the zone falls flat because of its linearity. A few more screenshots from the zone after the break. Read the rest of this entry ? Thanks to a huge bug in the current version of the Cataclysm Beta, I thought I would highlight the bug by taking a quick jaunt around the new Tol Barad Peninsula area. This is the Daily Quest area and it is now complete. All enemies are now implemented. The only thing that is currently not implemented are the actual Daily Quests themselves, some generic friendly NPCs on both sides. Oh and there is no flight path or portal that connects the zone to the outside world. The current thought is that this area is a glorified instanced zone. This is more than likely the methodology that Blizzard is using to prevent any more large scale server lag issues that Wintergrasp caused for the first year of Wrath of the Lich King’s tenure. By making this zone unflyable and only accessible through portals from Stormwind and Orgrimmar or through the Battlegrounds queue menu, they eliminate this lag. The only problem is, that this now does not have the feel that Wintergrasp had, being a large part of the actual game world. Is this a bad thing? Would Northrend have been a better continent if Wintergrasp was on some island that was on a different server? You are currently browsing the archives for the World of Warcraft category.